American Legion Post 39 recently placed a marker on the grave of veteran J.N. Whaley. 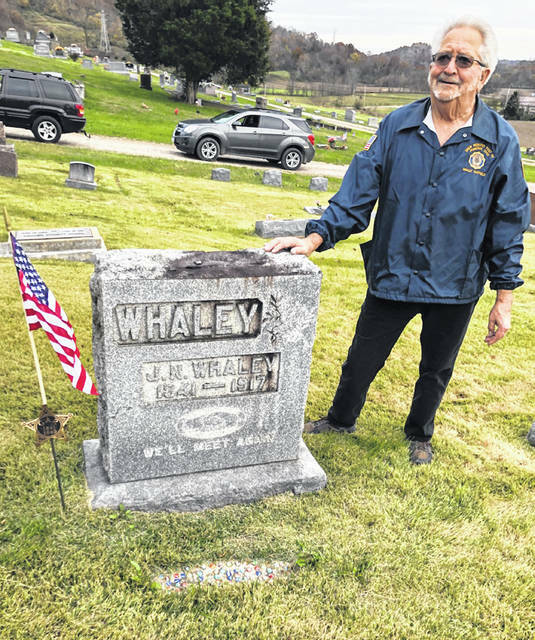 POMEROY — American Legion Post 39 recently placed a marker at a burial site to recognize a veteran. According to an statement from the post, a request was made from Keith Whaley (a former Meigs County resident and student). Whaley’s father was a well known teacher and Boy Scout leader in the area. The honored veteran was J.N. Whaley who served in the Civil War. He was the brother of Keith Whaley’s great grandfather. Placing markers on the graves of veterans is just one of the functions of the American Legion in their role of honoring the nation’s veterans. Members of the Legion participating in the event were Post Commander John Hood, 1st Vice Commander Sam VanMatre, and Post Adjutant Wallace Hatfield. Information provided by American Legion Post 39.
https://www.mydailysentinel.com/wp-content/uploads/sites/14/2018/11/web1_11.9-Veteran_ne2018118152814987.jpgAmerican Legion Post 39 recently placed a marker on the grave of veteran J.N. Whaley.